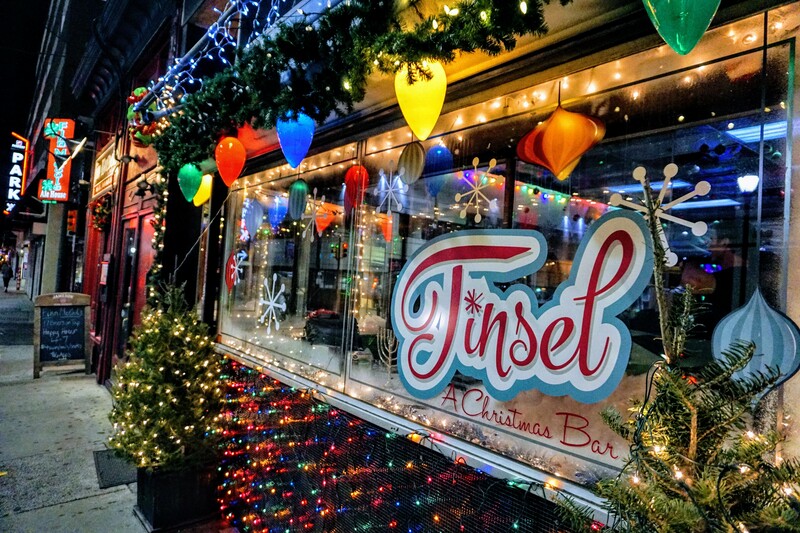 Teddy Sourias and Craft Concepts Group announce the season grand opening of Tinsel Christmas Pop-up Bar at 116 S. 12th Street, Philadelphia. The mad elves from Tradesman’s, BRU Craft & Wurst, Cinder Copper & Lace, U-Bahn, Uptown Beer Garden, Kontrol and Finn McCool’s Ale House have spent months decking the halls and brings back this holiday sensation back with an even bigger space, extended hours, more days, extra twinkle, added glitter, festive holiday tunes and more. New surprises include music playlist curated with help from Mr. Christmas himself, DJ Robert Drake from XPN, and a custom take-home Tinsel soup can with cocktail to benefit MANNA. The holiday-themed cocktail and craft beer bar will grand open on Thursday, December 6, 2018 and run through New Year’s Day. Tinsel‘s hours will be Monday and Tuesday, from 5:00pm to 10:00pm, Wednesday, Thursday and Friday, 2:00pm to Midnight, Saturday Noon to Midnight, and Sunday Noon to 10:00pm. Tinsel will offer happy hour specials Monday through Friday 5:00pm to 6:00pm with $2 off select craft beer, Winter Wonderland cocktails and wine. During Happy Hour, professional “mall” Santas will enjoy their first drink for free when they “drop down the chimney” in full Santa attire and show credentials. Mall Santas in full attire will drink for half off all other times! Tinsel will end the season with a special New Year’s Eve Party and New Year’s Day Celebration. Details of New Year’s Eve and other special events will be announced shortly. Custom glass stocking designed by CCG, dipped in signature red wax from Maker’s Mark. Tinsel debuts brand-new custom Tinsel inspired post-cards this year. The first 500 people will enjoy a post-card with live postage. Write a note to Santa, send a letter home, spread some holiday cheer. Drop your post card in the “Letters to Santa” mailbox in the main bar area and Tinsel‘s team will drop them daily at the post office for you.